Sapiens by Yuval Noah Harari is both a phenomenal origin story of the human race and a frustratingly biased and imprecise look at recent history. 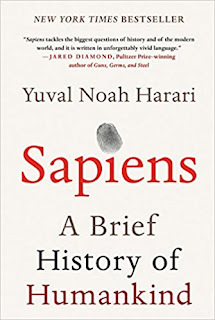 In much the same way that Bill Bryson opened up the entire history of the universe in A Brief History of Nearly Everything, Harari attempts to reconstruct the development of Homo Sapiens, including everything from our chimpanzee ancestors to our near future. Unlike Bryson, however, Harari has serious problems in keeping the focus on objective observations - and while that may not have been his initial idea in the first place, it becomes a big problem especially toward the end of the book. 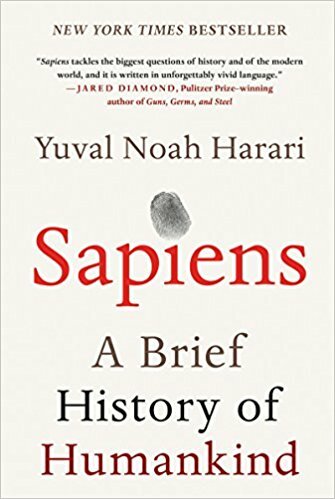 Sapiens is at its best early on, when Harari describes the origin of the different Homo-genus peoples. I didn't anticipate enjoying this part of the story so much. Textbook descriptions of hunter gatherer groups have never been able to capture my imagination in the same way as Harari does here. Not only do these chapters succeed in giving a vivid image of how humans lived at the time, but they also highlight the limits of our knowledge in an approachable and realistic way - much of the evidence of early humans has been lost to time. The early nomad expansions into Australia and the Americas are a fascinating example of the determination of early peoples to find new lands. For example, a few centuries after the first humans reached Australia, almost all of the large mammals of the continent disappeared in one of the worst waves of extinction. Before our arrival, Australia had been home to giant kangaroos and marsupial lions. The largest issues come later on when, Harari describes the industrial age and the modern world. The way he tries to sum up capitalism and science into neat packets does a disservice to the previous few hundred pages. The latter chapters are less an enthralling revisit of history than the author's attempt to shoehorn his own conceptions into pre-existing theories. It is here that Sapiens loses some of its objectivity and credibility. At one point, Harari claims that economic growth (and the belief in economic growth) are absolutely necessary for banks to take deposits and lend money. This is either a gross simplification or the author's attempt at Zeitgeist-type sleight of hand. I was able to get a mortgage because the bank knows that I have a steady monthly income that I can use it to pay back. This is in no way related to economic growth or the banks expectations that my salary will increase as time goes on. The bank could lend money even in a declining economy (and they do). Finance works (among other things) by smoothing out the immediate need for cash by guaranteeing income in the future. I am tempted to overlook Sapiens's problems because it did leave an immediate mark on me. The way it looks at the world is quite unique and it will force readers to question even their most fundamental beliefs. Just remember that Harari indulges his whims a tad too much. As a reader, you don't always have to accept his explanations and assertions. Reading Sapiens, you learn much about early humans that you didn't know would be interesting. And you'll be left with a lingering sense that there is still much to learn about yourself and the entire human race.